Sardined into Alan Wright’s wheels, with Neill Hunt, Mike Stocker and David Nickeas, we headed up to the hills this morning and set off on the walk that everyone else has been doing for the past few days (best foot forward chaps!). One member of the party had just stepped off a night shift and may have been a tad over-tired, but at least the loonball gabbling of the sleep-deprived made the journey up to the Pennines go that bit quicker. 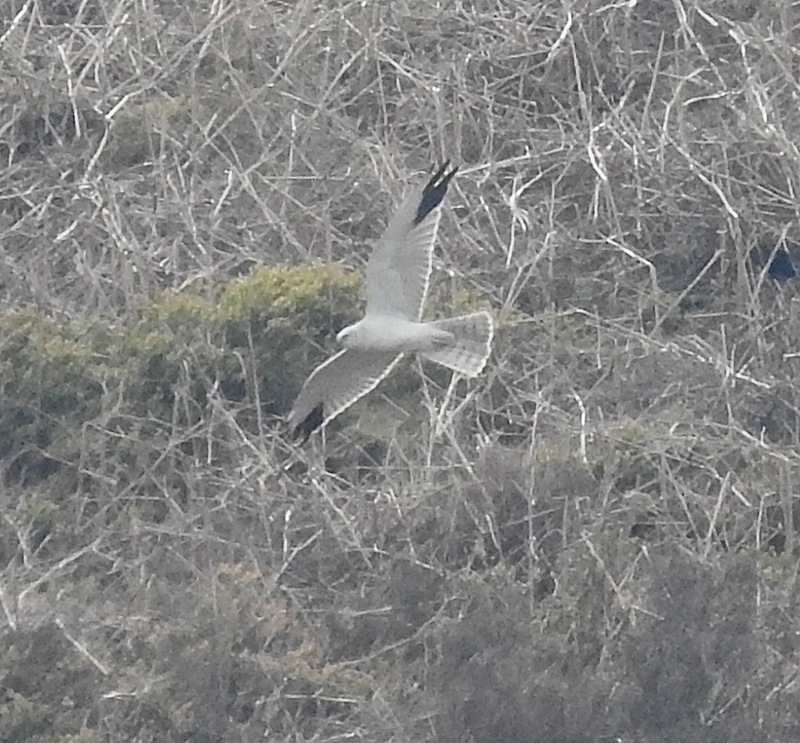 The five of us trudged up from Dunsop Bridge to Whitendale for a breathtaking hour or two with the male Pallid Harrier that has set up shop there. 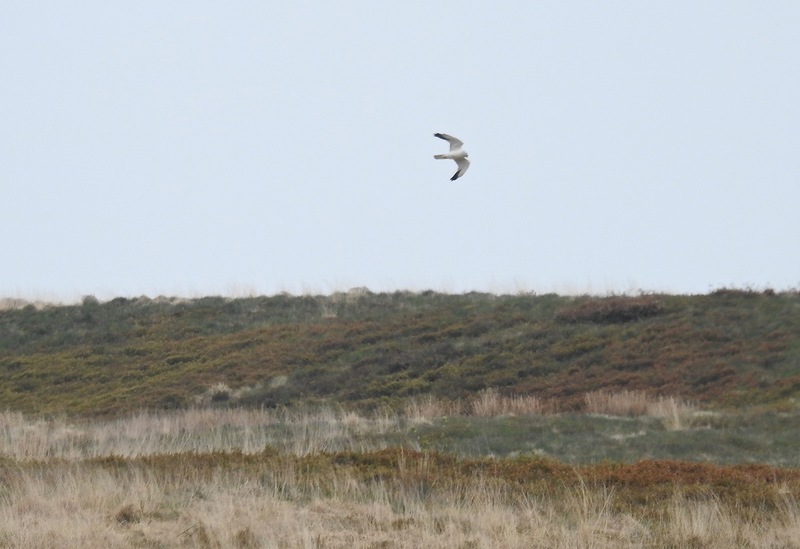 Now we all know that this part of the world is probably just about the dumbest place in Britain for a harrier to pitch up in, but the Pallid was a wonderful bird, and was floating over the heather for pretty much the whole morning. 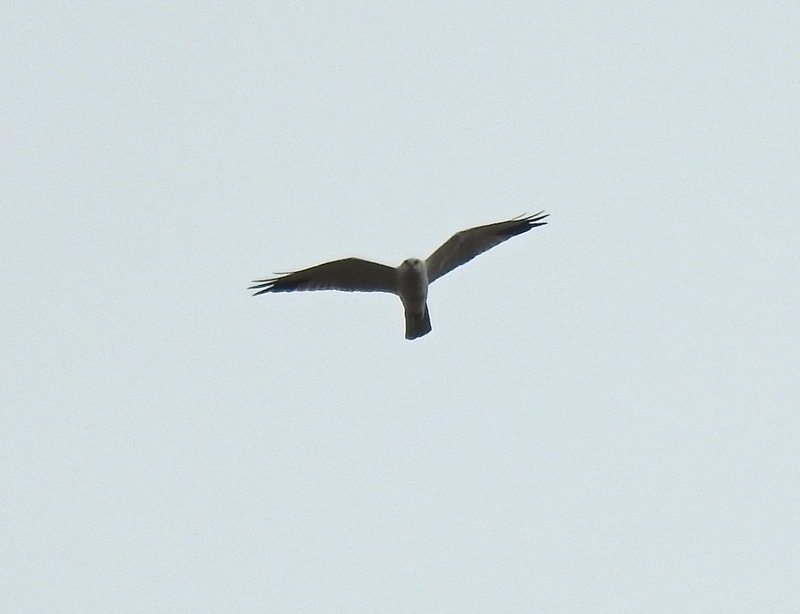 This thing is a bit of a show-off – it sky-danced, it yo-yoed, it chased a Cuckoo, it perched up, it chattered above our heads, soared, circled and generally had a party. The harrier was as bright and shiny as the bloke with the rifle strapped across his back as he rumbled by on a quad, was dark and sullen. 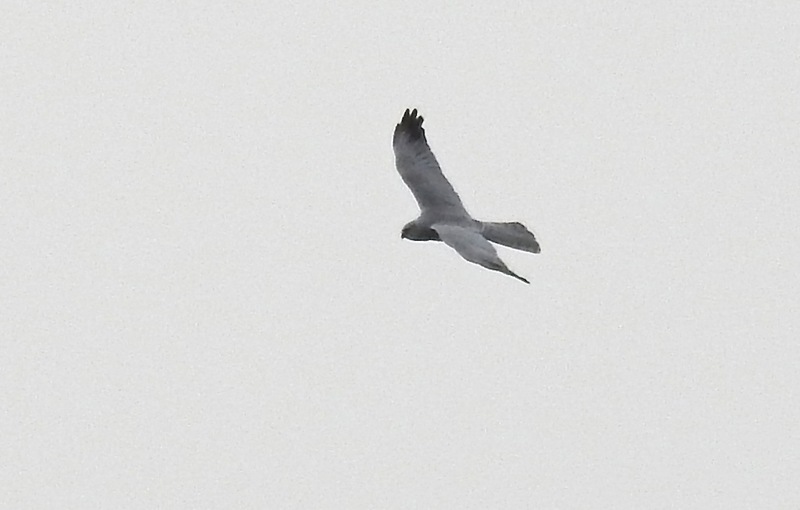 I was lucky enough to see the adult male Pallid about 100 years ago on the Kent marshes, but today’s bird was much more exciting as it floated above and around us, riding updrafts with the lightest of touches. Against the hillside it was as white as a gull, against the sky it was light and kite-like. The march up and down the valley also brought us Crossbills, Grey Wags, Common Sandpipers, Raven, Pied Flycatcher, Dipper, Redpolls and Siskins etc, but the splendour was tarnished after the news of the sad passing of Andy Roadhouse filtered through to the fells. The great man would have loved this morning. Cheerio Andy – we’ll all miss you. Too late to connect with this morning’s Wood Warbler at Marshside – I’d been out staring at empty soil on Plex for the umpteenth time this last fortnight, and the bird had long finished spluttering when I arrived. At least the Cetti’s Warbler on the SSSI ditch was in good voice. Out on the mosses five Golden Plovers had to turn to show their true colours as they fed in distant shimmering furrows, but they certainly got the pulse racing for a nanosecond or two. A lot more Whitethroats in and singing out on Plex this morning, otherwise situation normal (Yellowhammers, Corn Buntings, Red Legs, Lapwings, Red Legs, Buzzards etc). Later I went to say “howdy” to a single Green Winged Orchid (above) at a site away from the traditional colony at Altcar Rifle Range. 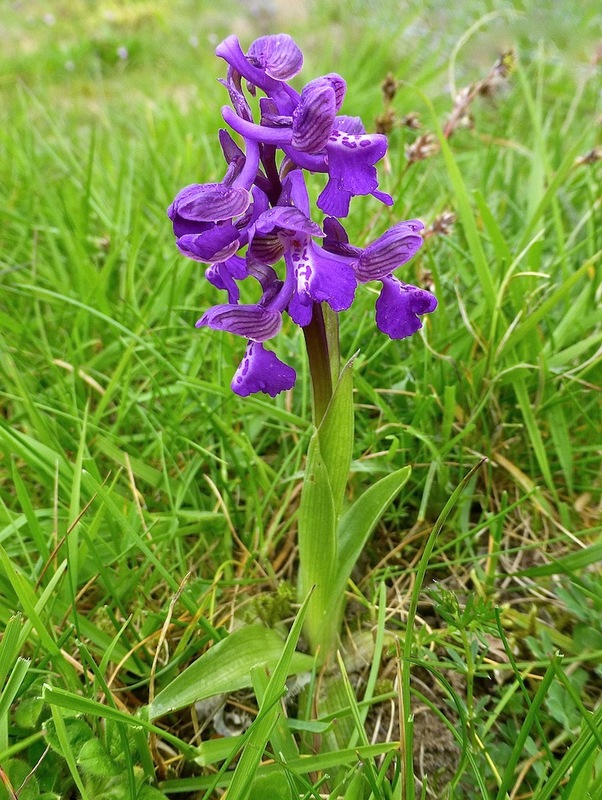 The orchid was blooming away, which was impressive a full three weeks ahead of their usual flowering period on the Sefton coast. Funny old climate these days ain’t it? 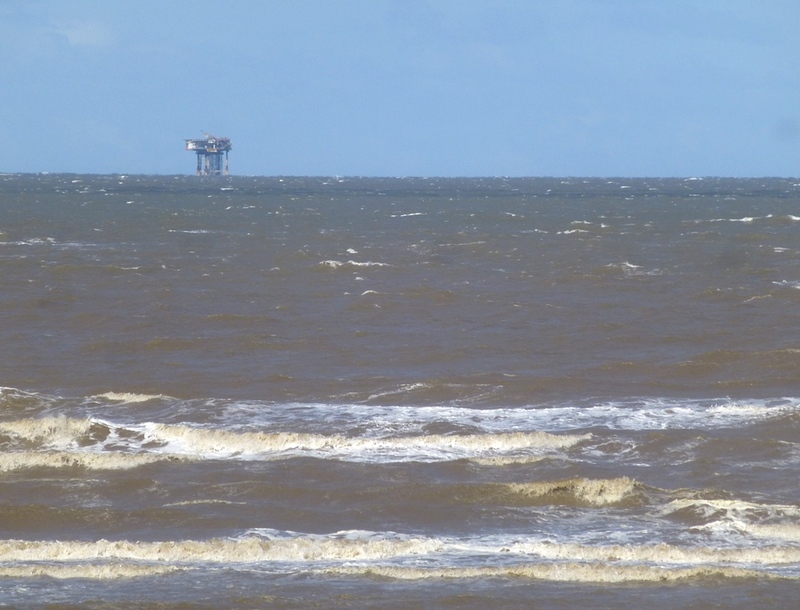 The high tide at Ainsdale looked quite nice in the sun today – but the camera lies…I’d lost all feeling south of me belly-button long before I took this pic on today’s brrrrracing seawatch. Managed an hour and a half, didn’t get a great deal apart from my first skua of the year, a fine Arctic Skua heading south and high at a rate of knots at 1055. Everything else was battling north in the pitiless, bitter north/north westerly. Swallows struggled along the tideline framed by the snow dusted Welsh hills across the water, and terns were on the move, but mostly too far out on the wibbly wobbly horizon to identify. 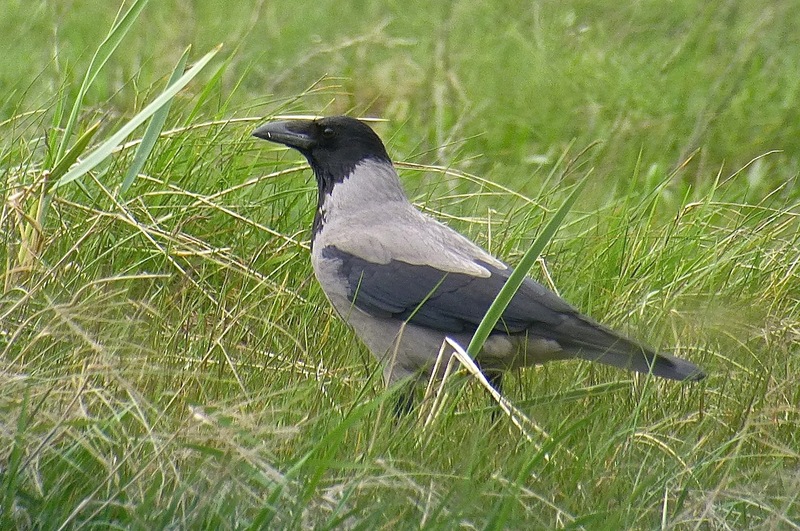 The Hooded Crow checked my pass at the Fairways roundabout this morning and I headed on up to Marshside – the Hoodie is a fine fellow, one of the best birds on the block at the moment in my opinion. I left him showing off on top of a lamp post. Despite the continuing cool westerly (to paraphrase the wonderful Mr Byrne, this is not my beautiful spring…), there seemed to be loadsa warblers singing this morning, with Grasshopper Warbler, Sedge, Reed, Blackcap, Whitethroat, Willow Warbler and Chiffchaff all audible from the Hesketh Rd platform. The Gropper was reeling away from the buckthorn by the platform and as I walked past it zipped out for a quick blast in the short vegetation by the roadside – great views! Loadsa warblers and loadsa birders too – Bazzo, Trops, Andy Pryce, Clarko, Pete Allen etc etc…plenty of eyes to the skies today. Wheatears around the Sandplant and Crossens Outer (where there were still 15+ White Wags), and many hirundines forcing their way north. 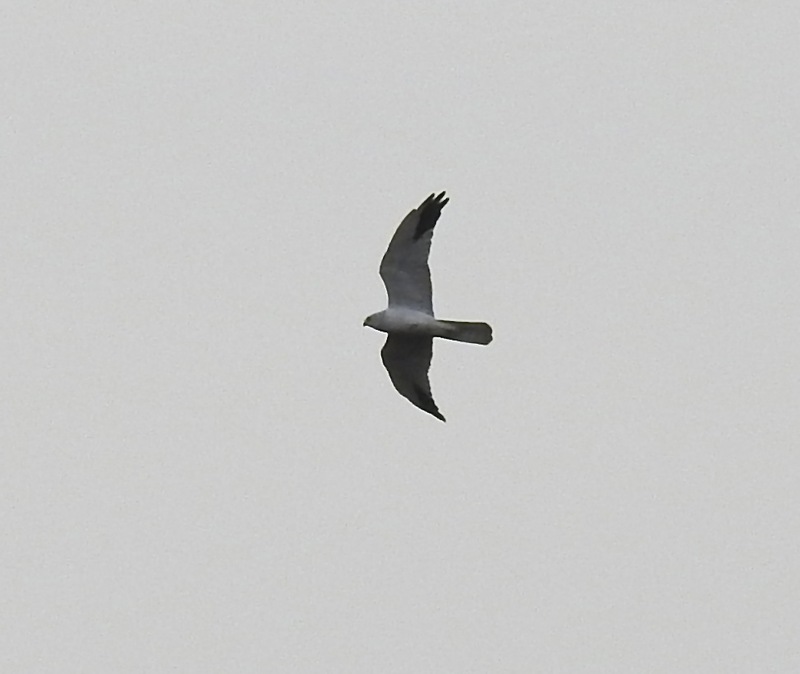 2-4 Med Gulls from Sandgrounders and a fine near adult Little Gull hawking over Polly’s Pool. 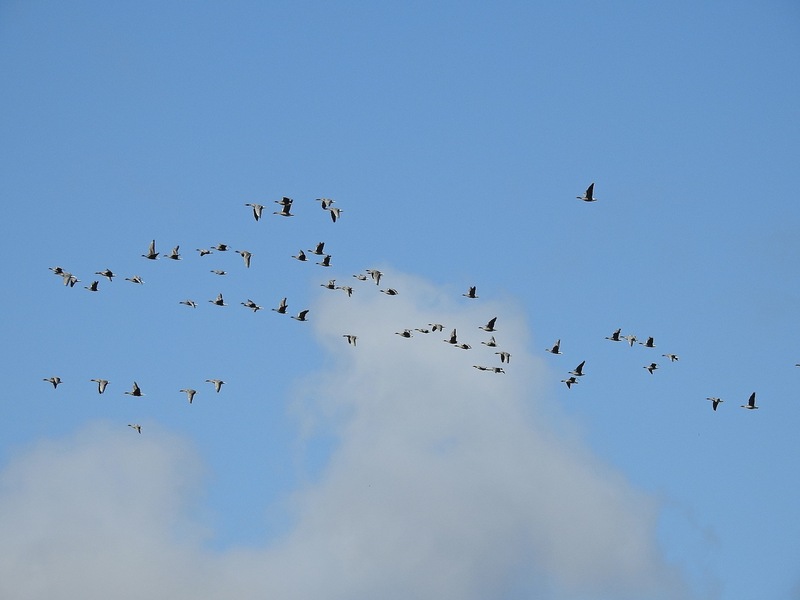 Still at least 2,000 Pink Feet on the outer marsh – I wonder when/if these non-breeders will bother to go north? Ruff (20-ish), Dunlins and Ringed Plovers from Nels amongst the breathtaking summer plumage Golden Plover, suggesting wader passage may start picking up any day now. 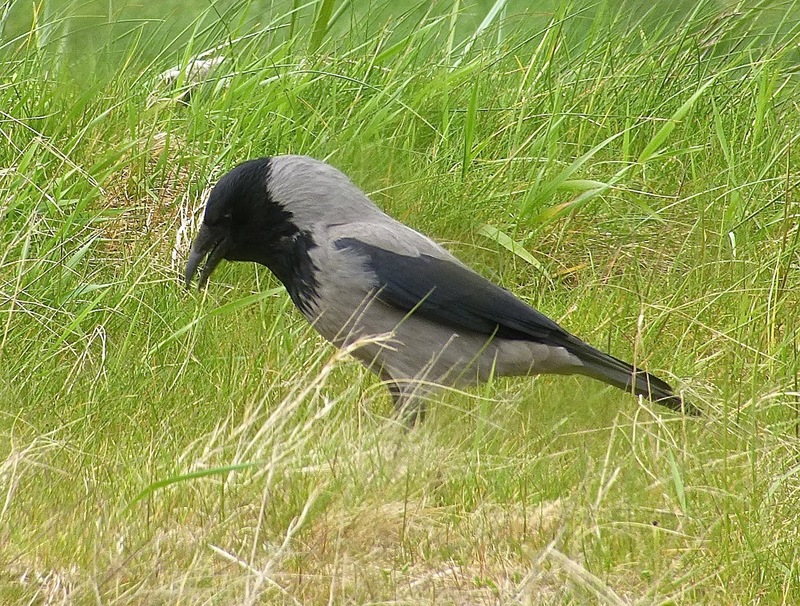 When I heard the Hooded Crow was tarting around in front of folk in the sandplant car park this afternoon, I decided I’d better go and have a look after work. Predictably there was no sign of it when I got there, but I gave the outer marsh a scan anyway, as Swallows fell from the skies, their tiny wings crusted with ice. Okay, that didn’t happen, but c’mon this cold, this late into April just ain’t right. Willow Warbler, Gropper and Whitethroat were all singing on the coast earlier in the day, but none of ’em sounded particularly happy about it. Parties of Gannets offshore this morning were all wisely heading south. 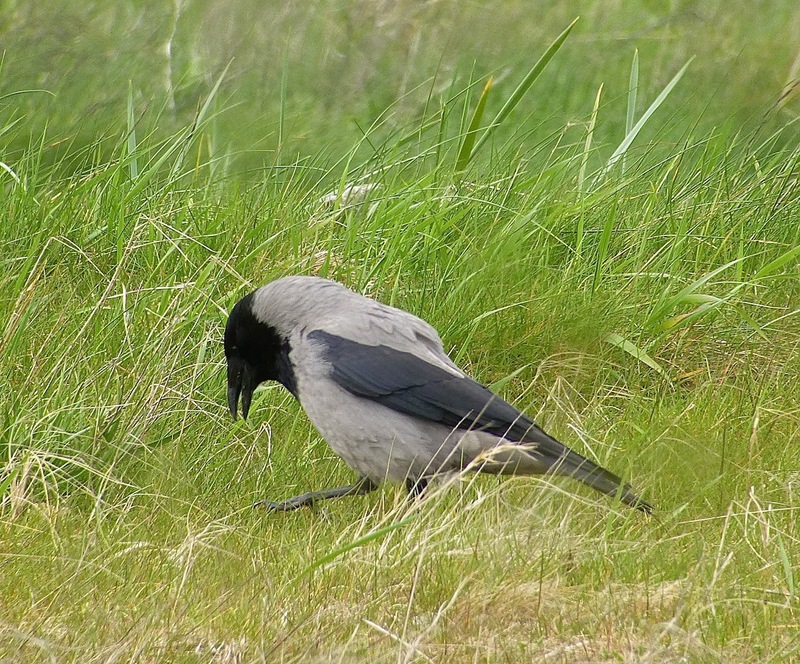 As I bounced back down the coast road from Marshside, I called in at Fairways on the off chance, and the Hooded Crow (great find by Andy Pryce yesterday morning btw) flew in to forage in the sandy vegetation below the slipway. As I didn’t have my bigboy P900 with me, I resolved to digi-scope the critter with my old Lumix and battered Nikon ‘scope, and was quite pleased with the results, despite all the scratches, glue and elastic bands holding the rig together. Undeniably I don’t know the first thing about photography. If you don’t believe me, next time we meet try talking about f-stops, ISO and exposure and watch my eyes glaze over and my mind drift off to where monkeys play tin-drums just like inside Homer J’s troubled cranium. Point glass end at pretty thing. Press button. That’s the way to do photography. This amateurish approach should be patently obvious to anyone looking at the pix on this blog, but hey, birds first, pix later. Unlike most other Hoodies, this one seems remarkably bold, a quite splendid chap that ignored me as it strutted around feasting on unsavoury items in the old tideline. Go see it – it’s a fine opportunity to get up close with one of these brilliant corvids without pointing the wheels north or west for way too many hours. 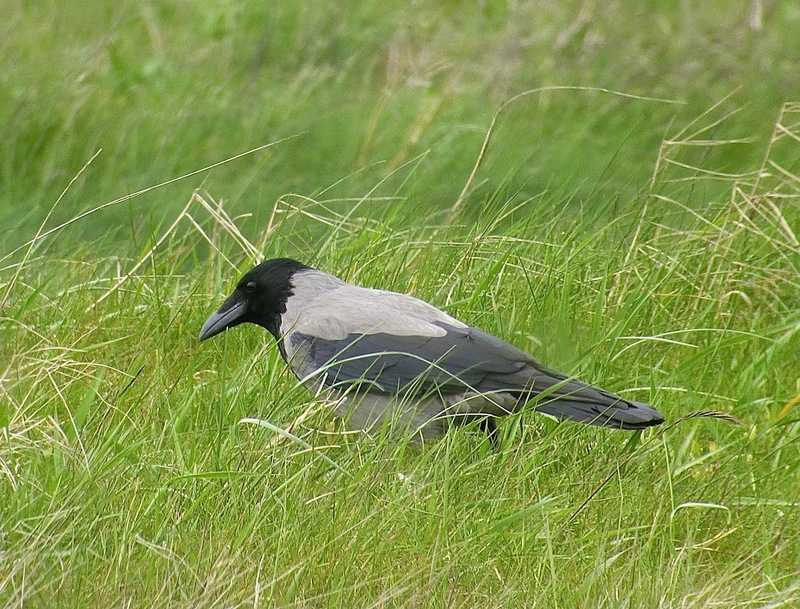 Conventional wisdom from the days when Hooded Crows used to turn up in early spring in the Marsh Farm fields behind Cabin Hill, is that records from round here are Manx birds drifting over, which seems to make sense. 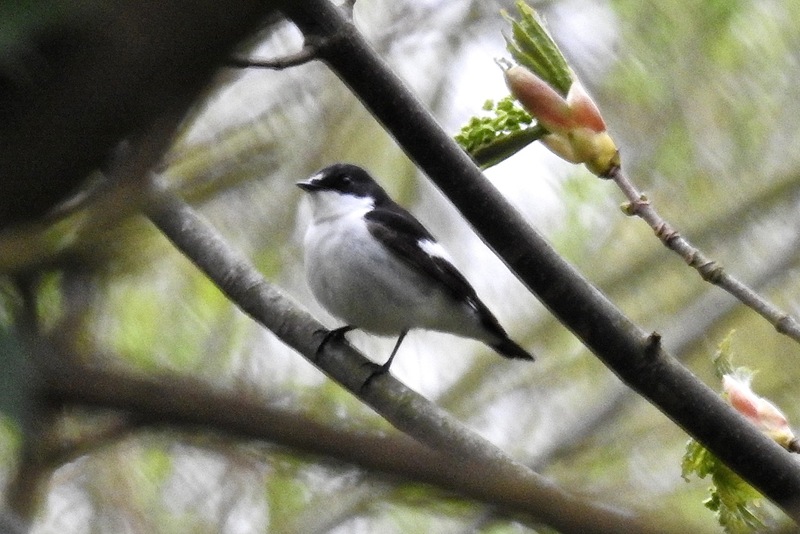 Crikey O’Blimey, I’d no sooner parked up on Hesketh Rd this morning for a check of the golf course than I saw Stuart Darbyshire walking off, beaming happy having just discovered a male Pied Flycatcher. 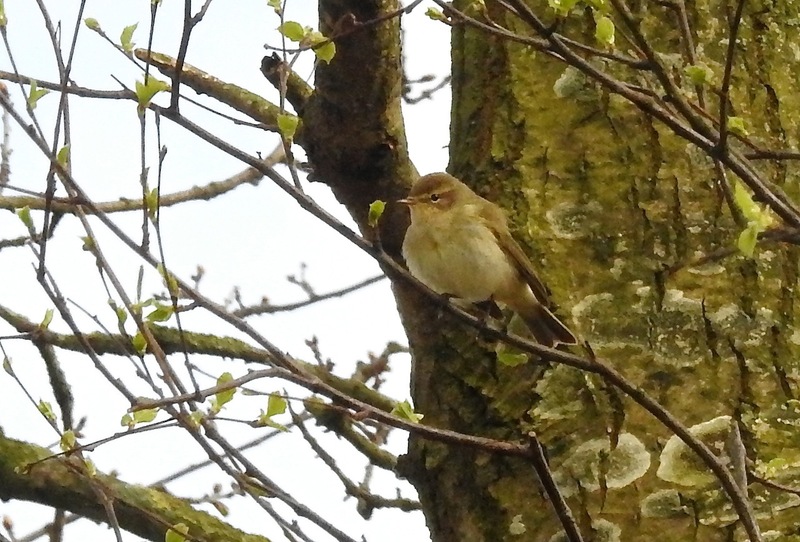 Moving quickly past many singing Willow Warblers, Chiffies and Blackcaps, I got to the area the bird had been seen and watched it with Bazzo and Neill for ten minutes or so as it zipped around the spring branches, a real cutey. 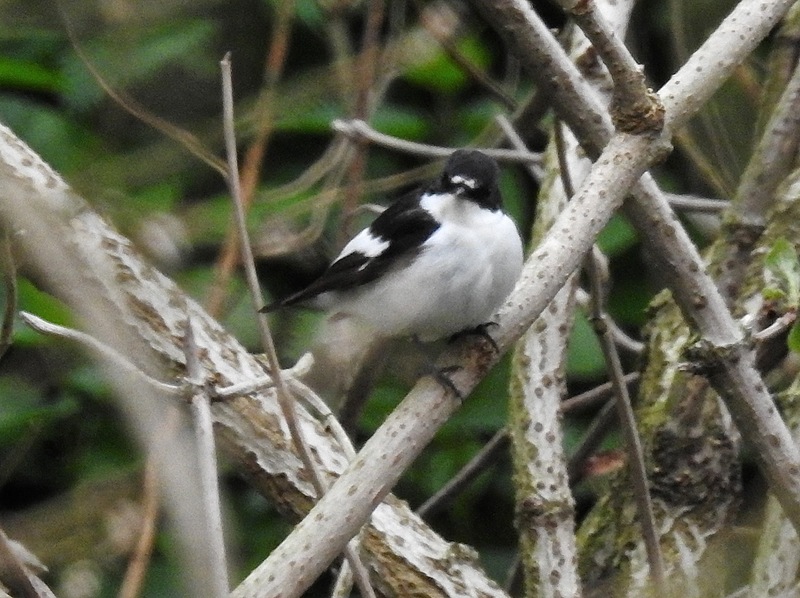 Not everyday you get to savour a Pied Fly at the marsh, the bird was a good sign for a bit of long overdue spring busy. There were certainly many more Willow Warblers about this morning. As more birders arrived, Neill, Baz and I moved on to check the rest of Marshside. 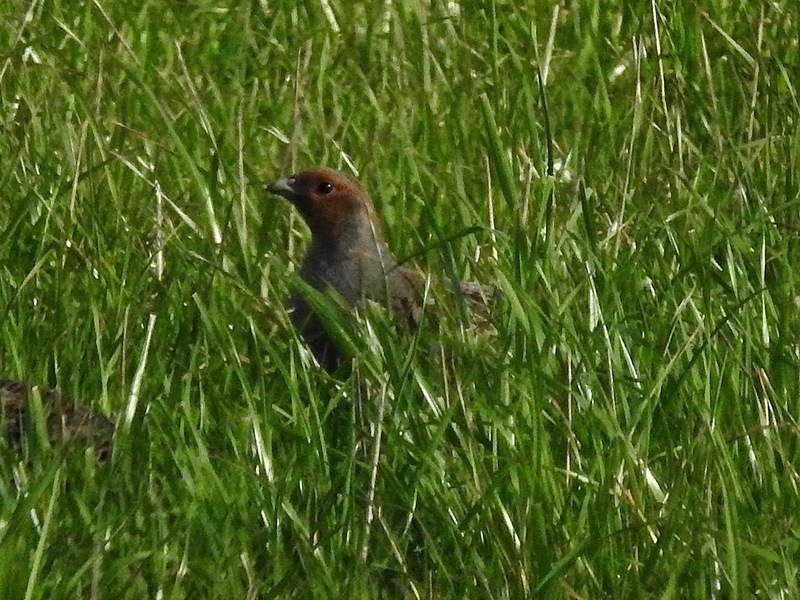 Reed Warbler and the Cetti’s Warbler were squawking and spluttering in the SSSI ditch, and a few Redpoll went through. 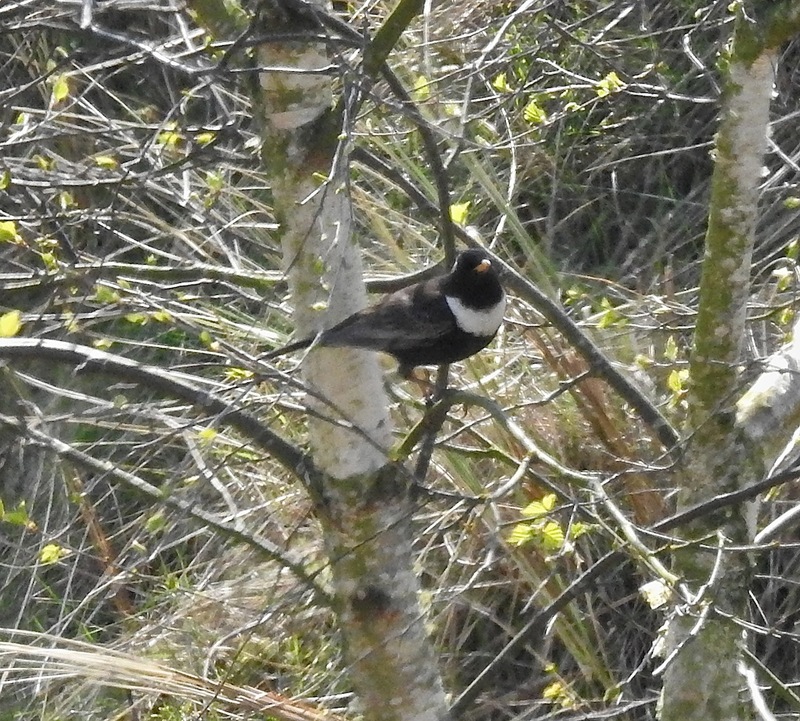 A Gropper was reeling in the corner as we ambled down to the Hesketh Road platform and plenty of Swallows, House and Sand Martins were on the move – this was more like it. 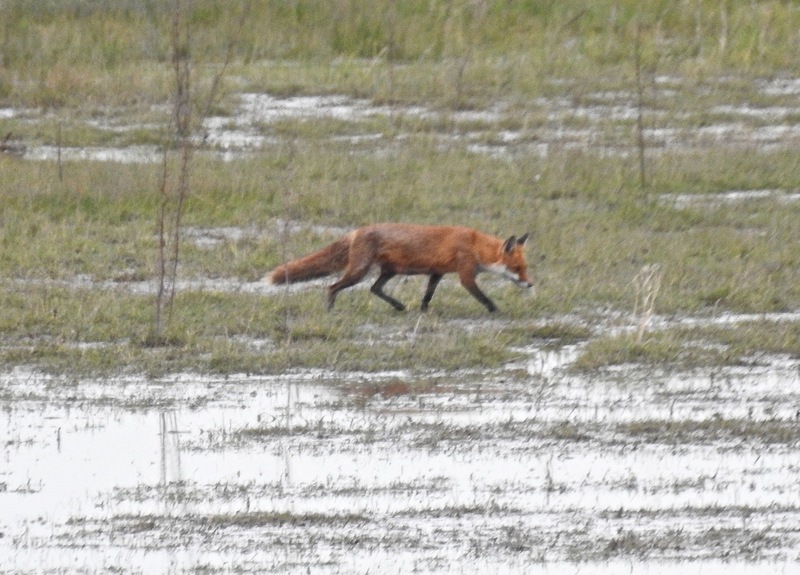 The wildfowl on the pool didn’t seem overly phased by a fine Fox that trotted about half-heartedly thinking about breakfast before she melted into the cover of the SSSI. 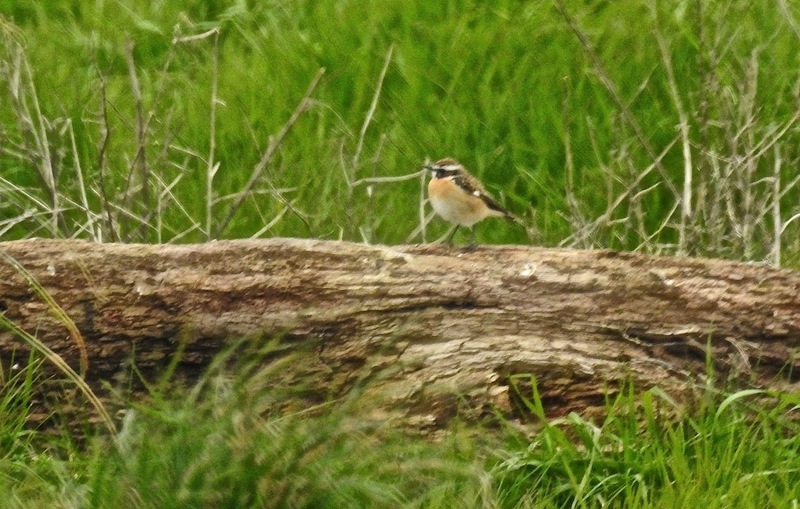 From there I drove up to the Sandplant, where a stonking male Whinchat glowed amongst the Wheatears on the lorry road – having texted the troops, we watched it zipping from perch to perch, but we never got particularly close before it headed into the old Sandplant compound. I counted at least nine Wheatear in there this morning, and with Mipits and Linnets joining them and the Whinchat, it felt good and birdy, even though there isn’t that much of the old place left now. 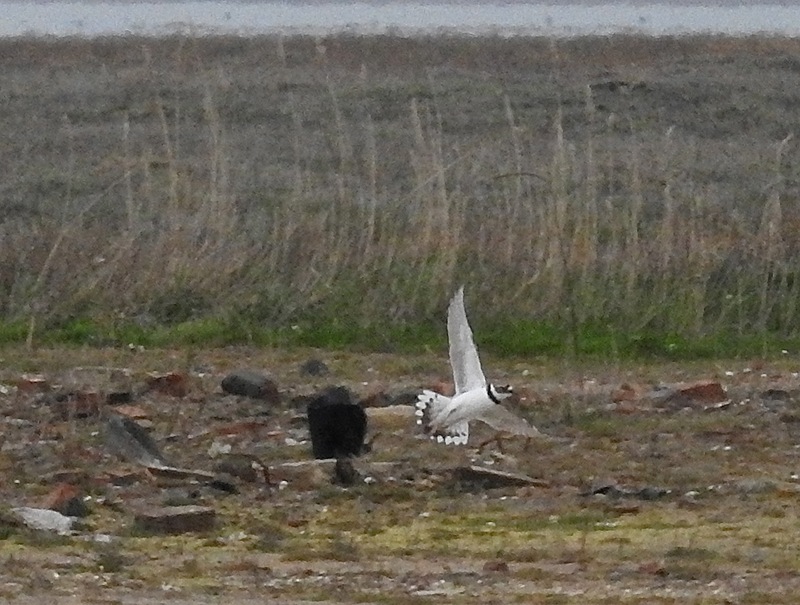 I heard a distinctive call and a Little Ringed Plover swept in, and landed for a few seconds before taking flight again, only to drop down in front of the Sandgrounders Hide (two Med Gulls on the pool this a.m.) a few minutes later. 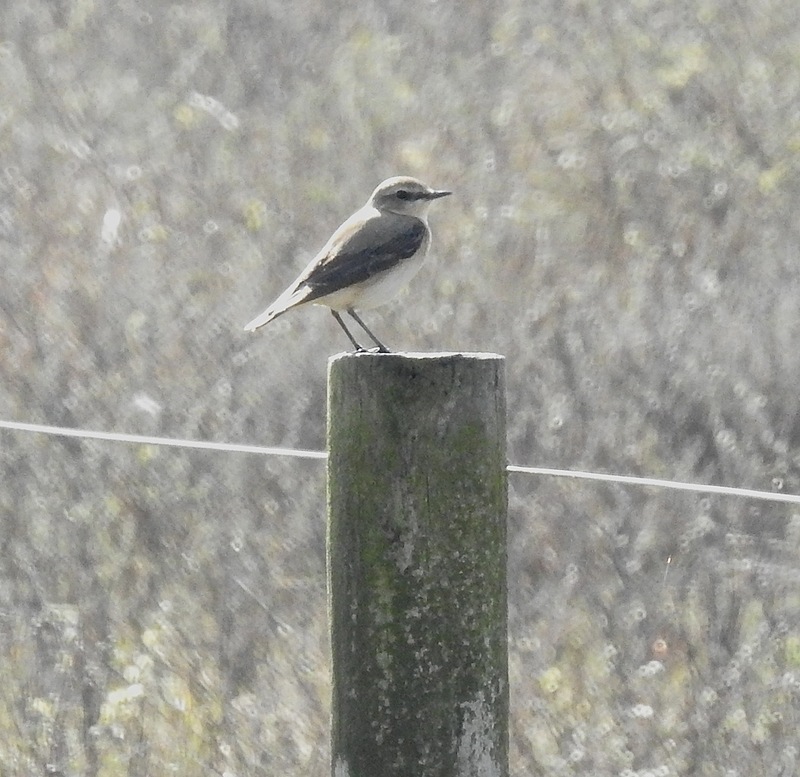 Two Common Buzzards circling over the outer marsh and another two perched on the old fenceposts, while up at Crossens another seven Wheatear ran about on the turf. Marshside getting its spring vibe on at last. 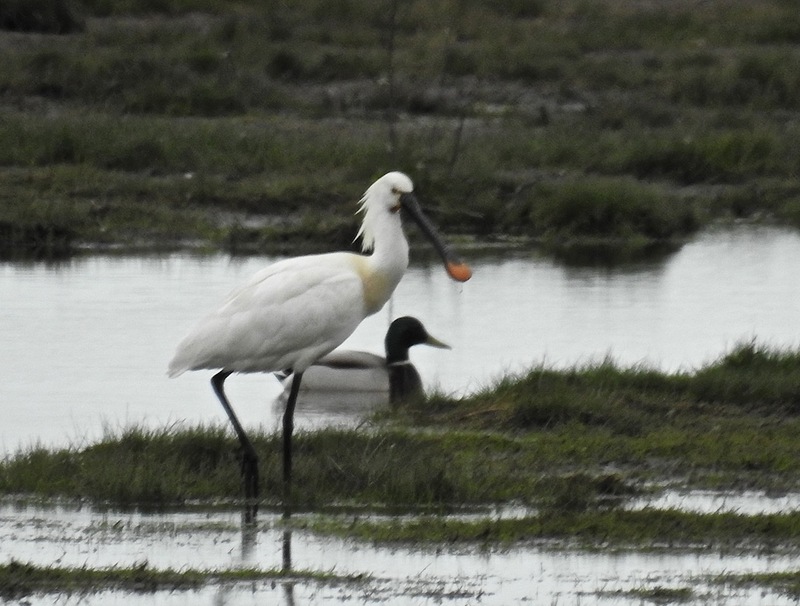 Yesterday’s Spoonbill was still clowning around at the back of Marshside Two today, best viewable from the path down from Dawlish Drive. 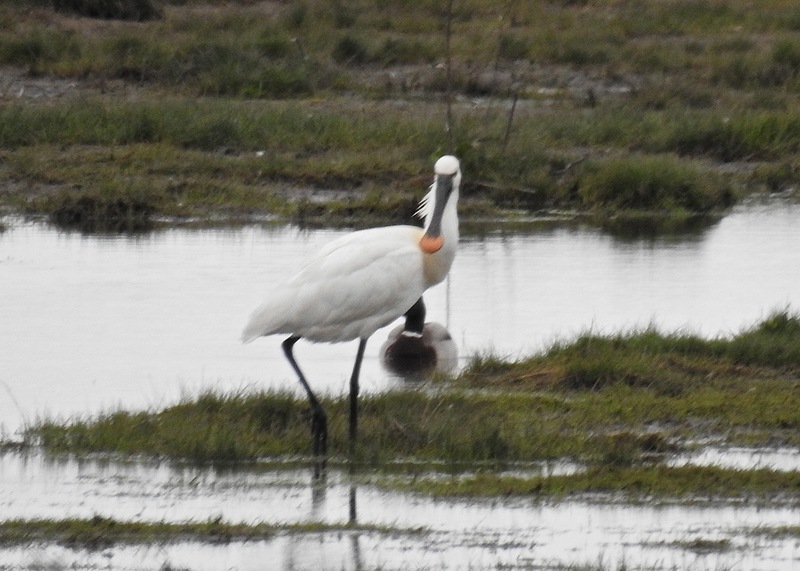 It was generally behaving like all Spoonbills that visit the marsh – sleeping for prolonged periods before a bit of sweeping spoonage in the channels, preening and clattering it’s yellow ended barbecue tongs at any Black Headed Gull that came too close. This one is in quite good nick actually – but still undeniably big and daft. Otherwise it was a strange morning – I was deeply thankful that the migration killing westerly had died away, but it was still cold and the birding was slow. Small groups of Sand Martins and Swallows were heading north, Ruff were getting frisky on M1, and at least three Wheatears were in the Sandplant. About 250 Golden Plovers dozed north of Nels, while 35+ White Wagtails were prancing around over on Crossens Outer. Still cloud darkening numbers of Pink Feet out there – non-breeders? 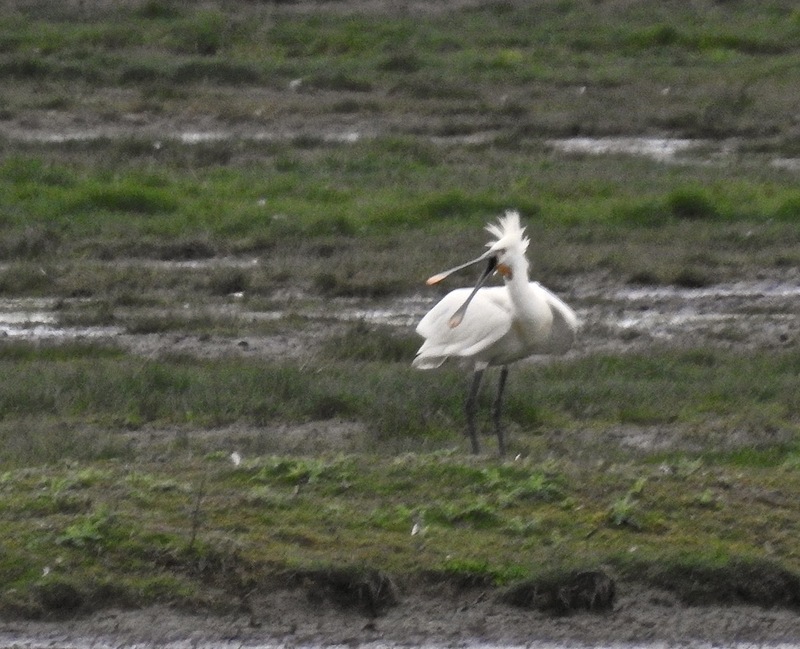 ‘Scoped two Med Gulls from Sandgrounders, and heard Chiffchaff, Willow Warbler and Blackcap singing away from the golf course. I finally managed to connect with the Cetti’s Warbler spluttering away in the SSSI ditch, although my arrival coincided with a large number of golfers and spectators who descended to watch some type of tournament on the Hesketh. Honestly, anyone would think they owned the place. 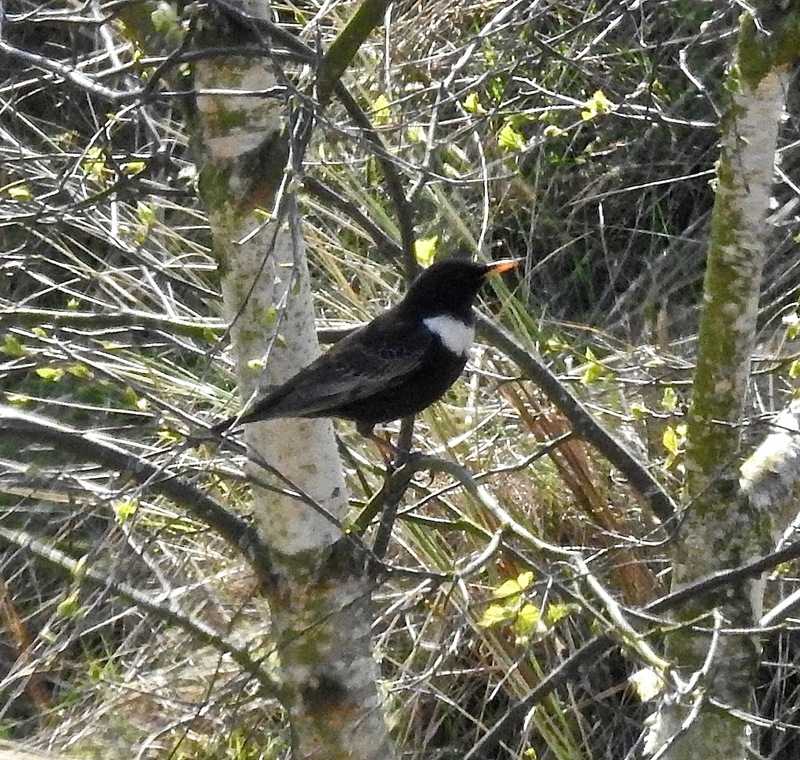 Their arrival meant checking for Mike Stocker’s male Redstart in the SSSI ditch willows was futile, so I left before contracting a serious dose of Pringle poisoning. The mosses were generally early spring empty, although there were still at least three Whimbrel on Plex with Curlews, a few Golden Plover and one notable party of 10 Wheatear (the biggest group I have seen so far this year). 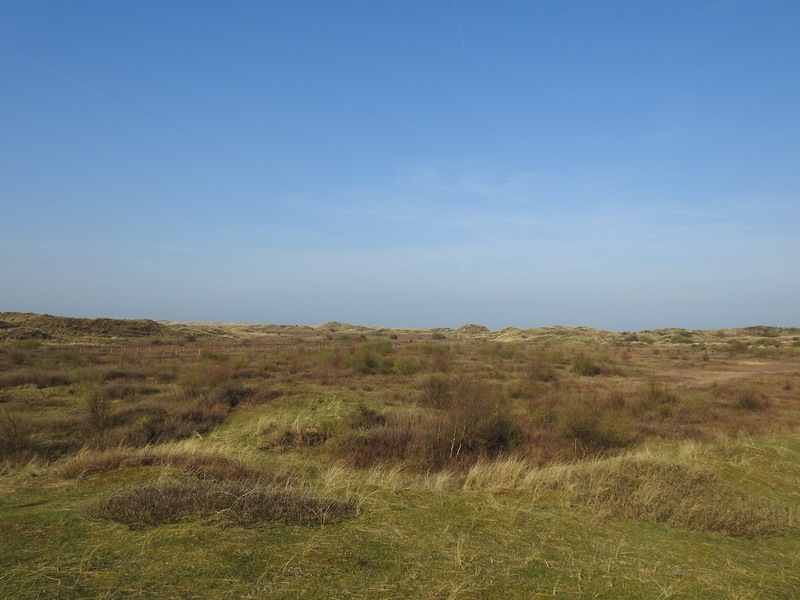 A week of Easter events ranging from children’s holiday clubs (of course you want to have nettle soup for your lunch) to Vernal Mining Bee workshops (3 sp of solitary bee at Ainsdale yesterday bee lovers) meant the smart money may have taken a break from the dunes. 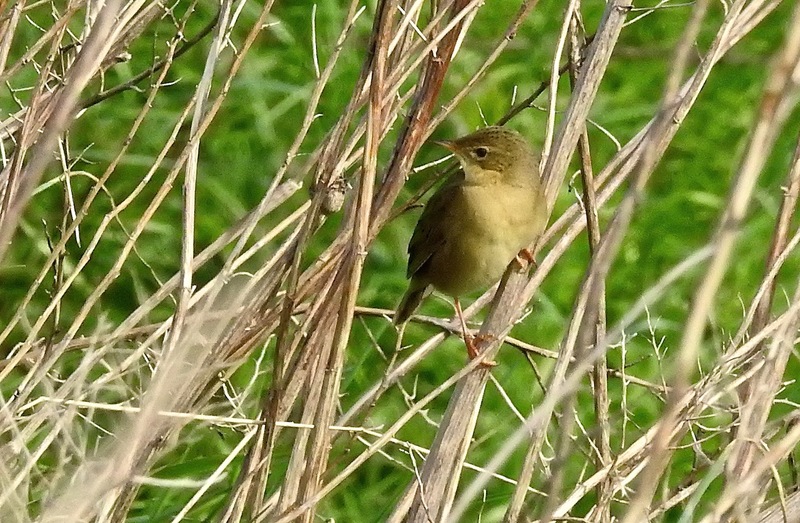 But the sunny was shining and I was awake early, so there I was walking south from Ainsdale Discovery Centre at 8am today, enjoying the cascade of 16+ Willow Warblers singing in the slacks, while a steady passage of Redpoll buzzed overhead. At least 4 Wheatears and several singing Stonechats on the way down to the sheep enclosure, with two Grasshopper Warblers reeling intermittently about 400m apart. 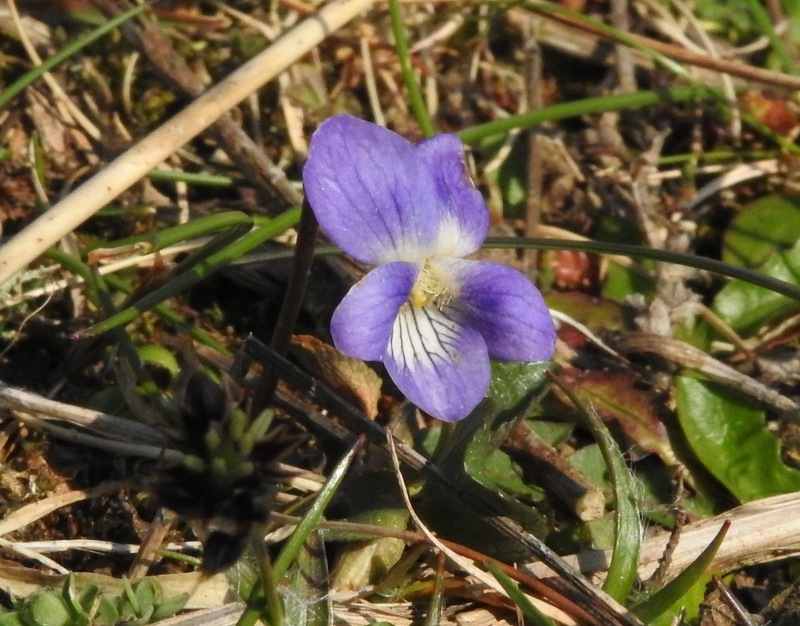 Three different Tree Pipits called invisible in the blue, and the first Heath Dog Violets were flowering – I can almost hear the Dark Green Frit caterpillars licking their lips. Far worse places to be than the dunes on a morning like this before the coast got too busy and the Natterjack tadpoles really started wriggling – Swallows, Little Egret and a juve Peregrine moved through (Merlin and Jay yesterday morning VisMig fans) with many Mipits and a few Siskins. As I was walking back towards Shore Road I saw Pete Kinsella and Mark Nightingale looking very shifty by a low dune ridge over by the coast road and as I approached Pete put his finger to his lips, then started drawing his hands across his chest. 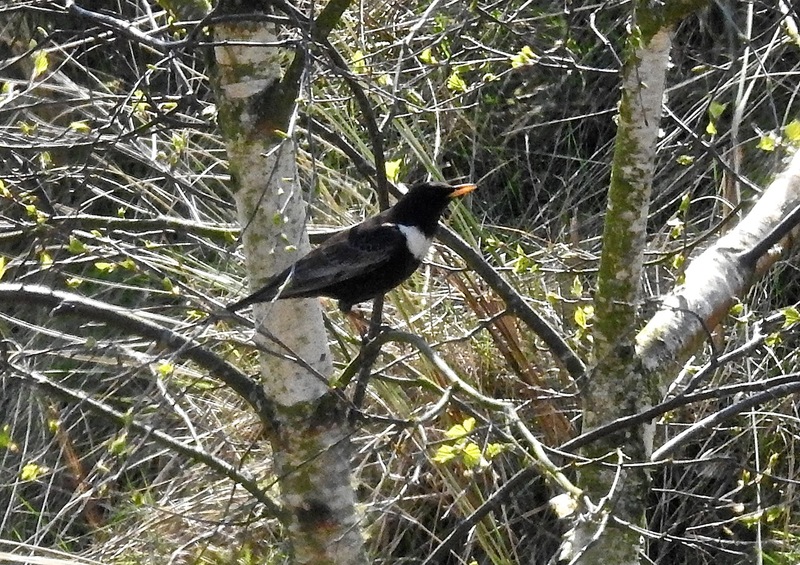 Either they were watching a Ring Ouzel or he was being improperly proud of his moobs. 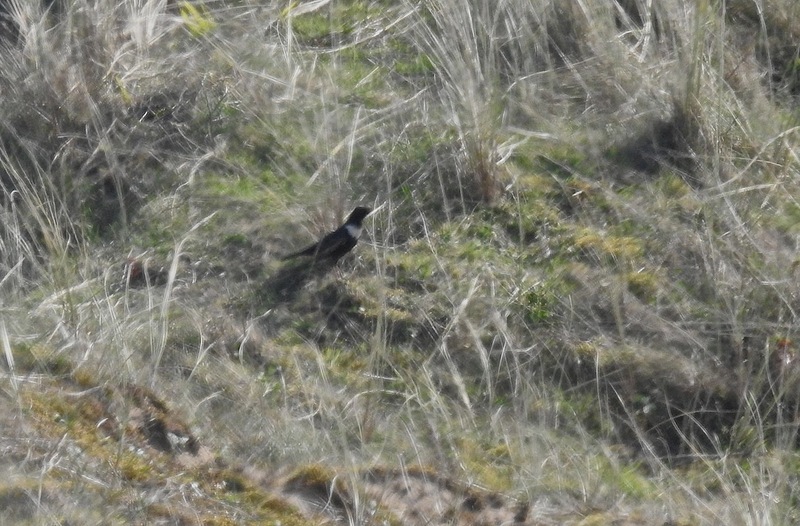 Fortunately it was the former – there was a fine, secretive adult male feeding in the shadows of a dune ridge about 100m away. The Rouzel was incredibly wary and we hunkered down then crawled up a dune ridge to peer over in an attempt to get a better view. 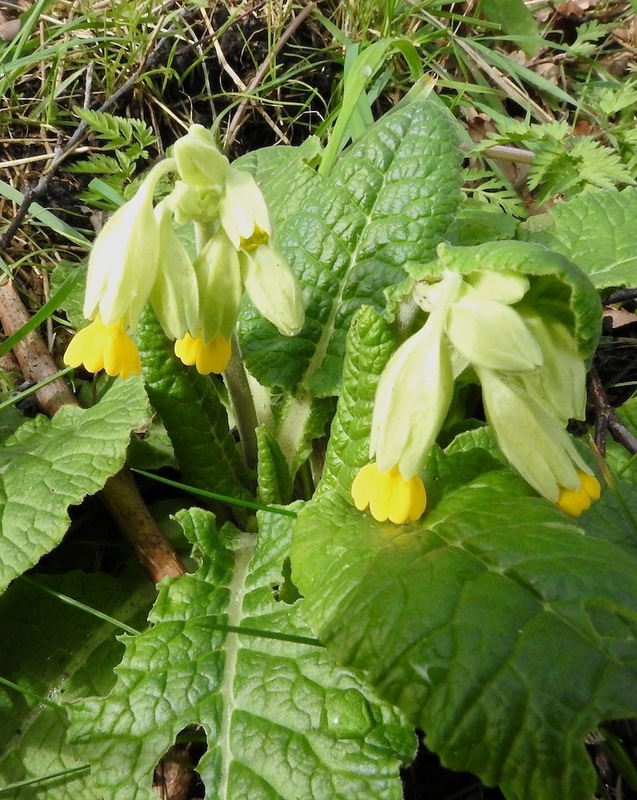 A wonderful, wild thing, always one of the best spring treats. Watching Rouzels is one of the few times you don’t mind crawling through cow poop – they are so worth it. Holding our breath the adult male dropped down the slope into some birch scrub where it was joined by a second, younger bird, which in typical sneaky Rouzel fashion had stayed invisible all the time we were watching the adult male. Fortunately they took flight when two walkers neared their hideaway and perched up in a birch just beneath us before powering off to the western side of the sheep enclosure where I lost them to view – they seemed to have dropped down though. I wonder if they were the same two Andy Spottiswood had yesterday? Hope they stick around like last year’s birds. If anyone is interested I’m leading 8 free birding walks this week – Monday to Thursday, setting off from Ainsdale Discovery Centre at 9am and Hall Rd car park at 6pm. A day as crisp and bright as a dawn Song Thrush giving it the beans (or a decent crunchy apple), deserved better, but the rescue of an “off-road” Peugeot got the most ‘scoping at Marshside this a.m.
How the unfortunate hatchback equation of tarmac x verge x flight came about is anyone’s guess, but watching the vehicle getting winched slowly back up the bank distracted us from birding for a time. Westerlies and sun kept things slow, yet there were still two Willow Warblers singing by the Hesketh Road platform (with another one at the Sandplant), Chiffies were belting away and a Blackcap “tuc tuc-ed” softly there. I had three Swallows and two Sand Martins whizzing north during the morning and Buzzards, including the sandy one, were about, occasionally spooking everything with faux-Osprey flybys. 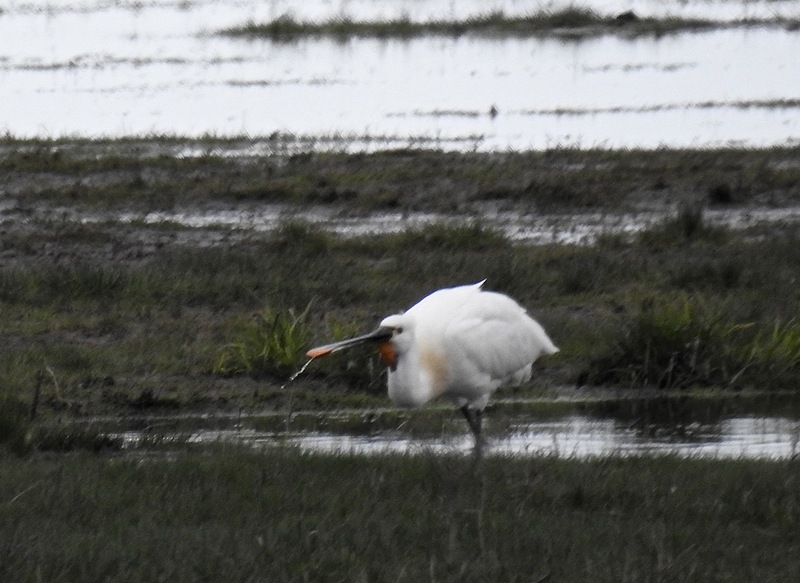 Wheatear, several Goldcrest, Blackbirds, Mipits and the aforementioned Willow Warblers were at the Sandplant, and three Med Gulls rose to possibly as many as eight, from Sandgrounders. The remains of the winter geese were strung across Crossens Outer and included the two Barnies and the troublesome small Canada Goose. 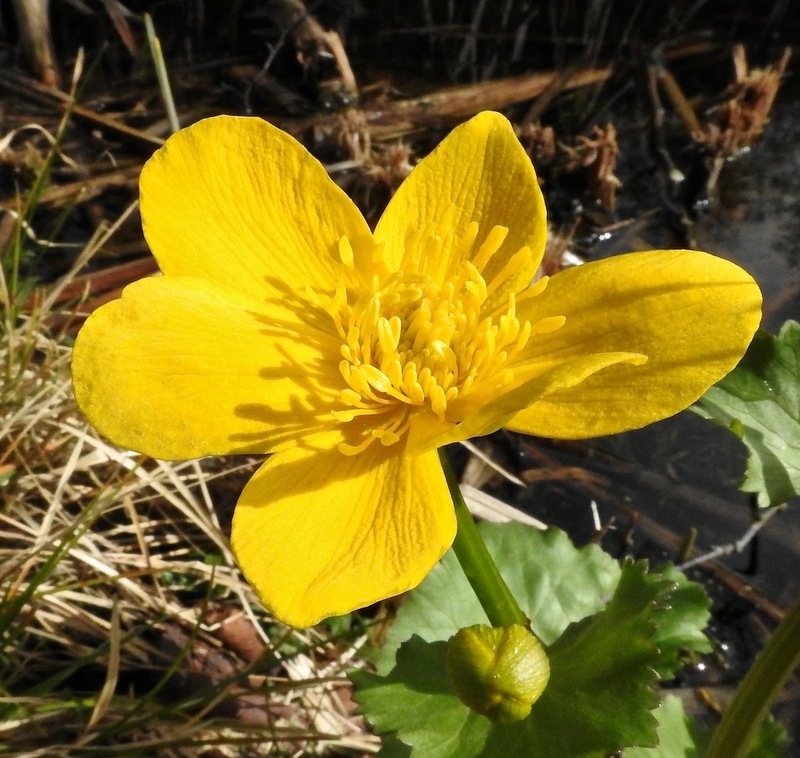 The mosses were pleasingly botanically yellow yesterday, with more Chiffchaffs, Sand Martin, Yellowhammers, a flock of 13 Mistle Thrushes and a few Golden Plover hunkering down amongst the Lapwing on flooded fields hinting at late April potential.